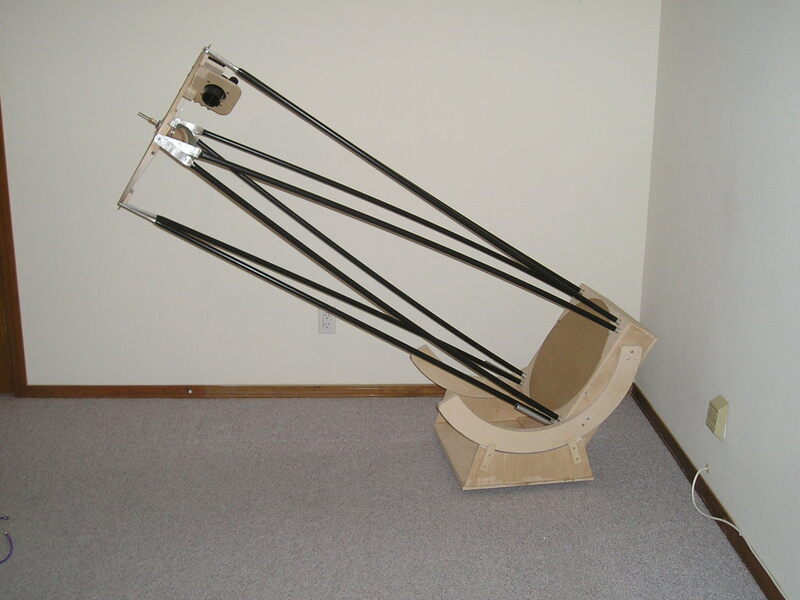 DS-3 has ended up being such a successful telescope that I decided to create a larger homemade telescope using the same ultralight design. This web page holds the results of these efforts. The original design and requirements page is located at DS-4 Design and brainstorming notes. 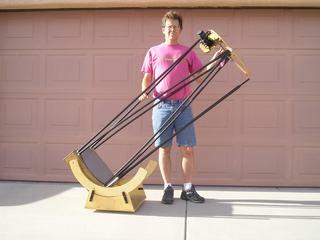 I also decided that this web page would generally just describe WHAT I did to make this lightweight telescope, not HOW I did it. Weights and dimensions are near the bottom of this page. I added a conclusions and results section at the bottom of this web page. To see how to create a "Deep Space Scope", see my DS-3 Deep Space Scope Design page. Although the design is the same, I would HIGHLY recommend going for a 16". It is worth the extra cost, and isn't much more work. I did decide to mainly use one version of wood - 1/2 inch apple plywood. (Apple plywood has many thin layers. It is NOT necessarily made out of Apple plywood.) I rejected composites because I felt that it wouldn't help much. The sides, top, and bottom of the mirror box needed strength, and the front and back (good candidates for composite) didn't add up to much weight. The secondary ring is already so light that it wasn't worth dealing with composites. The ground board is a good candidate, but is already so light that it doesn't matter. Clicking on any picture will give a larger version. Here is DS-4 at Datil Well, a dark site in New Mexico. The file that you download if you click on the picture is very large, but shows off how the scope looks. Notice that there is no shroud. A very good light baffle has made it irrelevant. The scope was designed to accept a shroud, however, if the owner wanted one. 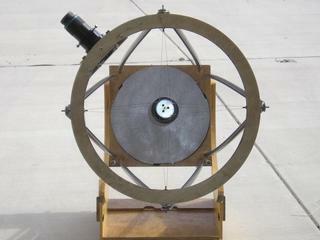 The mirror box is small, allowing the scope to go into the trunk of a car. Since the bearings are easily removable, their size is irrelevant for transport. Notice that the balance is very good - and that an ultralight can and should have a good balance. The scope doesn't sink or raise at all, even when looking at objects on the horizon. After removing the baffle, the scope deals with wind very, very well. This is generally the last scope standing on a windy night. The scope doesn't vibrate, unless there is a very strong wind. Then, touching one of the trusses mostly dampens out this vibration. The scope is easy enough to lift that I can carry it into fields away from other cars and people. Here is the finished product. The strange looking guy behind the scope is me. 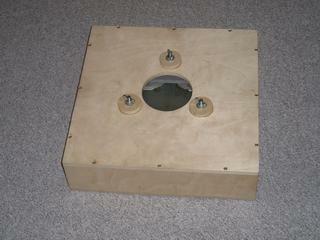 Notice how small the mirror box, ground board and secondary cage is. The bearings come off to fit in the trunk of a car. The trusses lay beside the front seat passenger. I have cut off the sides of the rocker box by 1", and tightened the mirror screws (thus lowering the mirror a bit) and cut the trusses shorter by 1". I also rotated the focuser a bit towards the side of the telescope. Thus, I have shortened the scope enough that I can do all of my observing from the ground. Yay!!! I am 6' 0" (minus a fraction of an inch) tall. Another view of DS-4. A mirror cover is in place. Side view of DS-4. The center of the bearings is the center of gravity of the optical tube. Notice the 2" feather touch focuser, which adds weight to the top of the scope, thus increasing the size of the bearings. The bearings come off with 2 screws per side for easy transport. 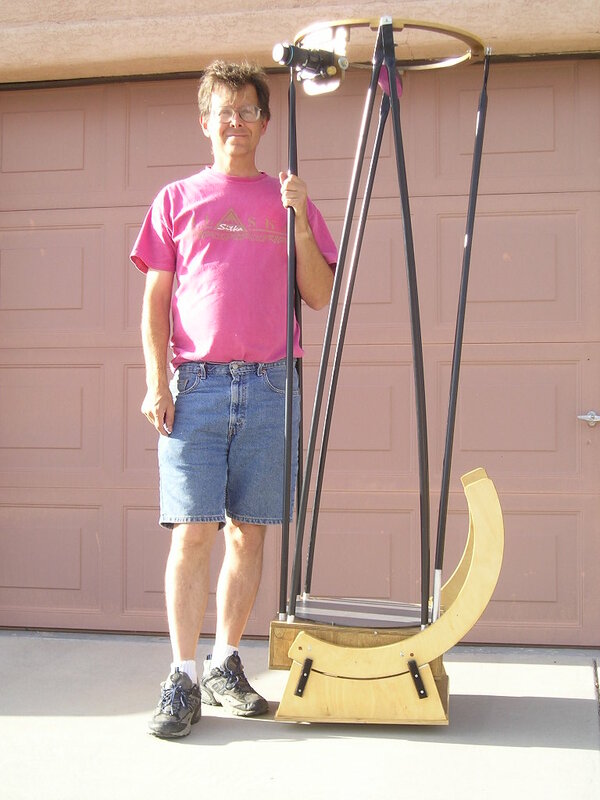 Jim Lawrence - master telescope craftsman at work. Jim originally built the "Deep Space" design scope that I used as a template. 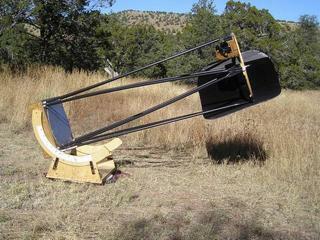 Jim has since built a beautiful 12" binary telescope that never stops amazing fellow "cyclops mode" observers. 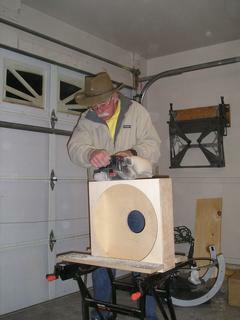 This is the mirror box for my 16", with Jim doing a bit of cleanup sanding. Picture of DS-4. 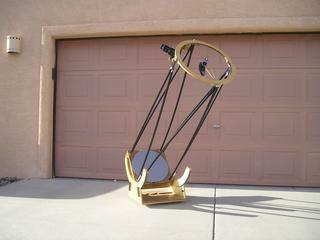 Obviously an open truss telescope. They eyepiece height ended up being about 5'10" high at zenith. Motion is very smooth. The heaviest piece is 40 lbs, and the total scope weighs about 60 lbs (not counting the baffle). Setup time is about 10 to 15 minutes. Another picture of the scope. Balance ended up being right on, and no weights have to be added to the mirror box. I made the attachment points for the main bearings fit into one of three sets of holes in the mirror box - thus allowing me to "field change" the balance. Here the bearings are attached to the middle attachment holes. 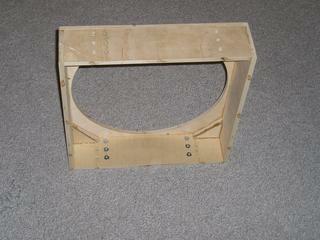 I have since cut off the sides of the rocker box 1", thus lowering the scope by that 1". I have found that ebony star works fine for altitude bearings (against Teflon), but doesn't work well against magic sliders, such as on the azimuth bearings. I just used a smooth laminent from Home Depot. Once again I added stiffening to the base board, trying to minimize vibration. See the DS-3 design for more details. Notice the holes in the side of the mirror box. 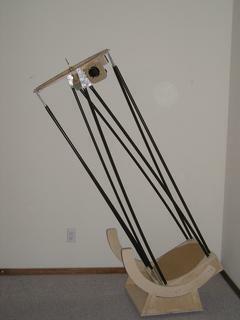 There are three attachment positions, to allow for changes in weight at the upper cage. 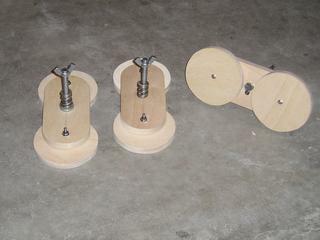 The bigger holes are for dowels (that are glued into the bearings), and the smaller holes are for two bolts. Focuser is a 2" feathertouch. Wow, nice. This is the stowed position. The aluminum short trusses go in a main truss hole, but are stored in auxiliary holes that were cut in the top. See below for pictures. Here is the scope stored in the hatchback position. Although the bearings are taller than the scope, they aren't that tall. Notice that the stored position for the scope is rotated 90 degrees from it's "in use" position. This allows it to sit a few inches lower. Mirror cell. At the heart of any telescope is a good mirror cell. My mirror is 1 5/8" thick and 16" in diameter. It was purchased from a local ATM builder that had lost interest. 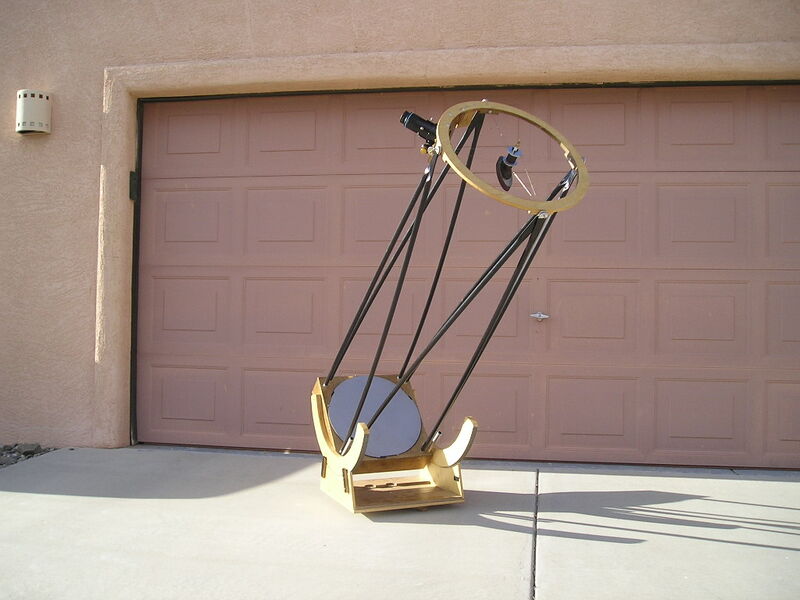 It is a Meade mirror, and appears to be excellent. The mirror cell is 6 disks held on two arms. The mirror is attached to the mirror using double sided sticky tape. The mirror box and mirror. I put the truss holes in the corners to create a "cage" for the shroud. The mirror box top is 1/2" thick, with two 1/2" thick triangles glued into the corners. The truss holes are 1" deep, and the trusses are held in place by friction and torque only. Each hole was then strengthened using CA (Superglue). The mirror is about 3/8" below the level of the top of the mirror box. Underside of the mirror box. Notice that the mirror is still in the box, and is hanging from the mirror cell and double sided sticky tape. I also decided to put one big hole in the box for cooling, with the idea that I could add a fan here later. So far, this has not ended up being necessary. Inside of the mirror box. Notice the embedding nuts in the sides of the mirror box. Also notice the additional wood wedges in the corners to add strength to the trusses. Wire spider. Notice that the wires don't attach to the center core at the same spot. By attaching the bottom wires and the top wires 90 degrees from each other, I get an interesting effect. The spider is VERY stiff in all directions, including rotation. 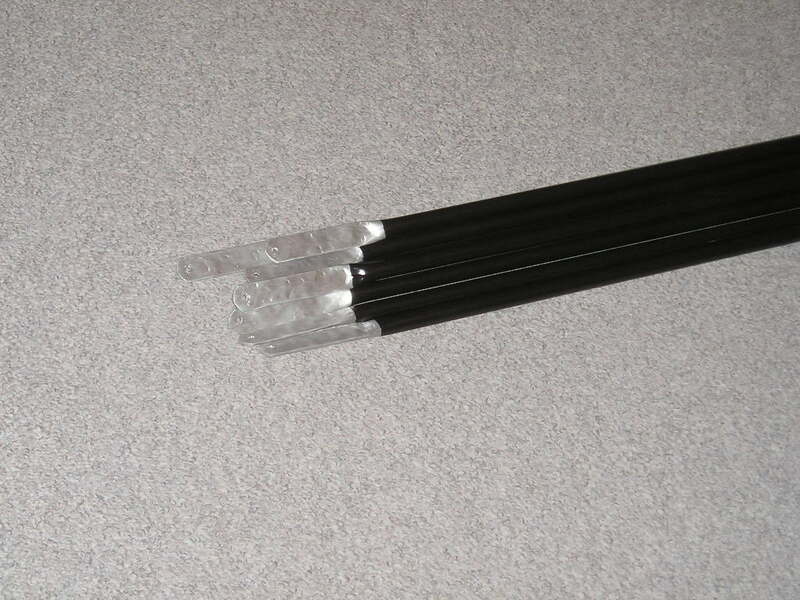 DS-3 is hard to columate, because the center shaft rotates as you turn the columation bolts. This design is rock solid. I can also easily pick up the secondary cage from the center. The secondary is attached with double sided sticky tape to a piece of round Masonite. This allows more surface area, and keeps the tape's working load below it's maximum working load. Generally, there is only a single thickness of 1/2" plywood for the ring. Light, and plenty strong. The focuser board and pointer board are bolted onto the ring. 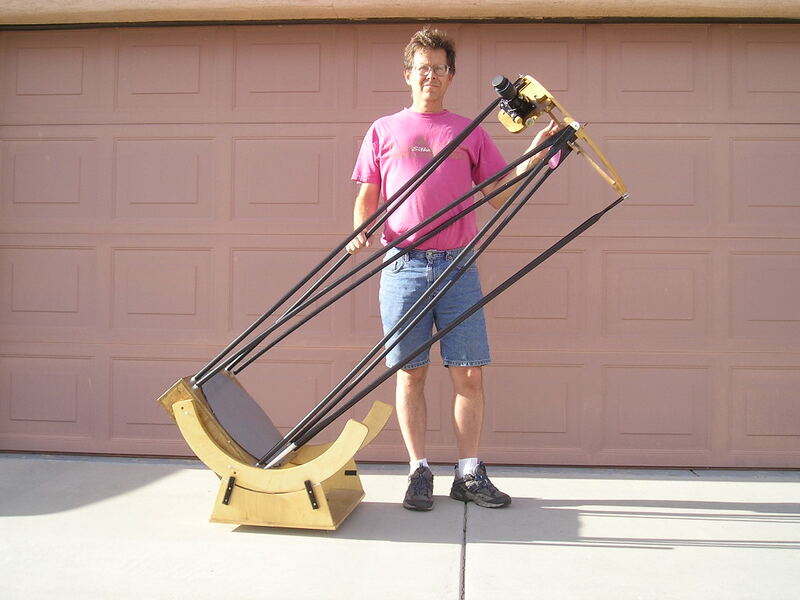 This allows me to remove it - in case I ever try to take the telescope on an airplane. Lengths for the trusses had to be carefully measured and cut. If you do keep all of the trusses exactly the same length, the trusses go onto the metal screws easily. If not, there is always a fight to get the trusses on the screws. NOTE: After 1.5 years of good service, the double sided tape on the secondary failed me one hot afternoon. The scope was in the truck, and got fairly hot. Nothing happened to the secondary, but it sure gave me heart palpitations. I have since used silicone glue to attach the secondary. Another view of the secondary "cage". This one is down the main axis of the scope. 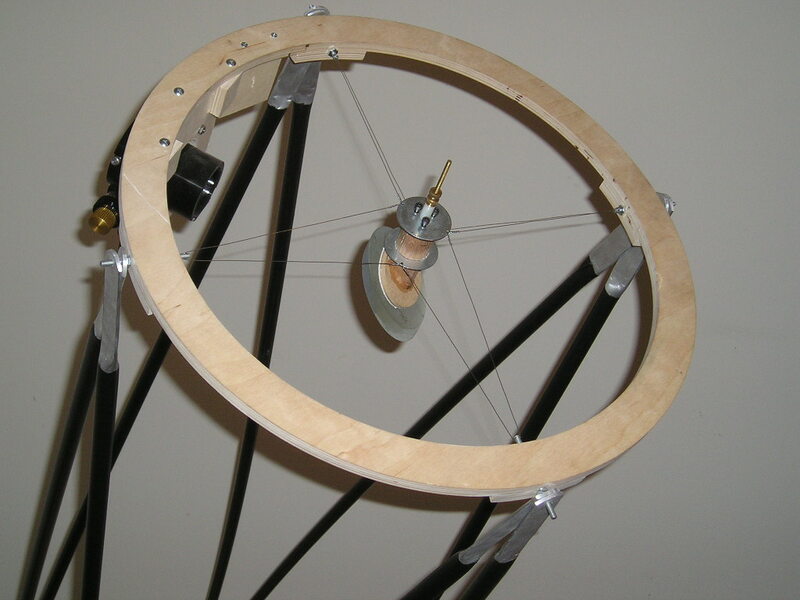 Notice that the wires do not radiate directly from the center of the axis, but are actually offset. Surprisingly, this does not change defraction spikes at all. So much for theoretical ideas. Spider. Here you can see how the spider stack is created. So far, I am thrilled with home grown wire spiders. The secondary mirror is 3.1" wide, and comes from AstroSystems. Truss ends. The trusses have been covered with wide electrical tape. Size of mirror box and base, secondary, no bearings 20x18x17"
Size of mirror box and base, secondary, and bearings 20x18x25"
Results - Did it work? DS-4 has ended up being wildly successful. It is a telescope that rivals any other scope that I have tried in it's size, always draws a crowd, and easily fits in my car. It is also easy to carry and doesn't take up much space for storage. Images are fabulous, and it is easy to use. It was also reasonably easy to make, and fairly cheap. Setup/ tear down - Setup takes under 10 minutes. 1) Pull scope out of the car, place where it goes. 2) Remove secondary cage. 3) Drop in trusses. 4) Attach secondary to trusses. 5) Columnate ( 6 Possibly attach baffling.) 7) Attach Quickfinder. Tear down is also under 10 minutes. Quickfinder - has ended up working fairly well. Objects are easy to find. The quickfinder is out of the way as placed on this telescope. Due to the focal length (and thus magnification), I use the lowest power eyepiece available for star hopping. I have also placed degree markings along the sides of the bearings and on the ground board. This allows me, with the aid of a palm pilot and appropriate software, to be able to point the scope within about a degree of an object. 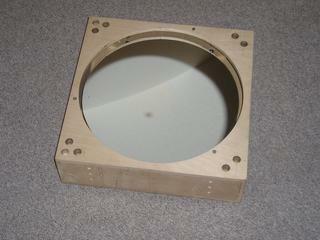 2" Feathertouch focuser - This focuser is a joy to use. Although a bit heavy, I will never use any other focuser again. Internal baffling is built in,and is excellent. It focuses precisely, and holds focus every time. It has a very precise hold on the eyepieces, thus keeping the eyepieces well aligned with the scope. Upper "cage" design. Wow. This has worked out very, very well. The 1/2" plywood ring is plenty stiff, and very light. The wire spider is excellent. It holds columation well, and is light weight. Surprisingly, from physics and practical testing, the width of the spider veins doesn't matter - it is the edge of the veins that causes defraction spikes. Thus, wire gives no better view than thick wood veins. Finally, this wire spider really looks cool! Trusses - 3/4" trusses are working very well. There is no backlash at all as you are moving the scope. Columnation is rock solid, no matter what the orientation of the scope. (See mirror cell below.) Adding wide black electrician's tape has helped with looks, baffling, and to make it more comfortable to move the scope. I find that I generally move the scope by grabbing a truss and dragging it around. The truss attachments have worked out very well. They never slip, are easy to make, and have held up well. When putting the scope together, it does take a few minutes and a bit of experience to get the tops of the truss tubes lined up properly. 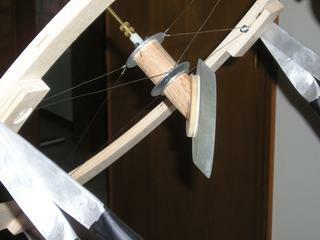 I have added four threaded shafts to the sides of the focuser holder to hold the brass connection nuts when I am setting up/ tearing down. Mirror box - This has worked out very well. Relatively light weight, indestructible, and a bit of a dust barrier. Altitude bearings - These are working very, very well. I used ebony star, and they are plenty sticky. Making these bearings removable has been a godsend. When I transport the scope in a trunk, I can remove the bearings, when I move the scope by hatchback, I leave the bearings attached. Movement is smooth and precise. Mirror cell - The mirror cell has worked like a charm. It stays in columnation no matter what the orientation. I have driven the scope up to 457 power (8mm Orion Superwide Lanthanum with a 2X Televue BIG barlow), and could see NO astigmatism at all, no matter what the orientation. The mirror cell also probably cools the mirror down about as fast as is possible without a fan. Mirror cooling - The Aire rings around stars never did stop slowly waving, making me believe that I have surface layers on the mirror. Next project - a fan that will be attached to the top of the mirror box using dowels. 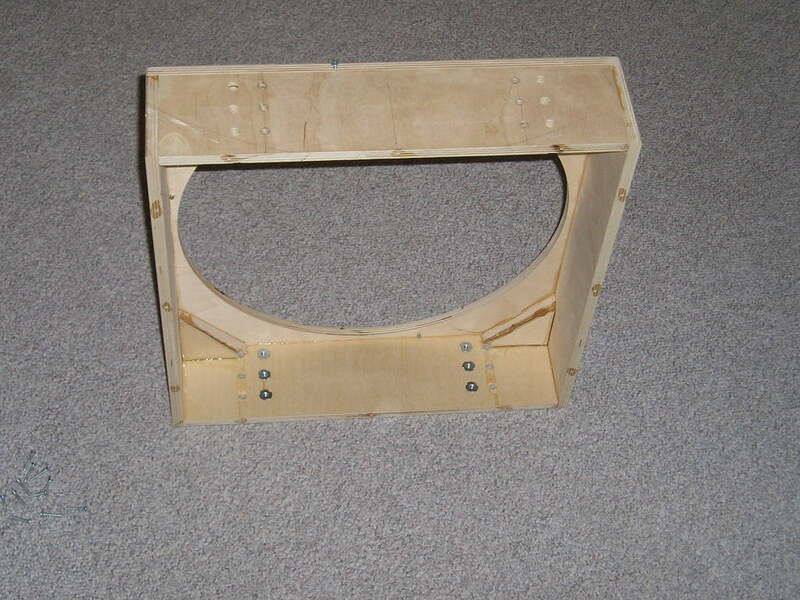 Rocker box and baseboard. These have worked perfectly well, giving very little backlash (or bending) when adjusting the scope. I think that the current design is about right - stiff enough without wasting material and weight. 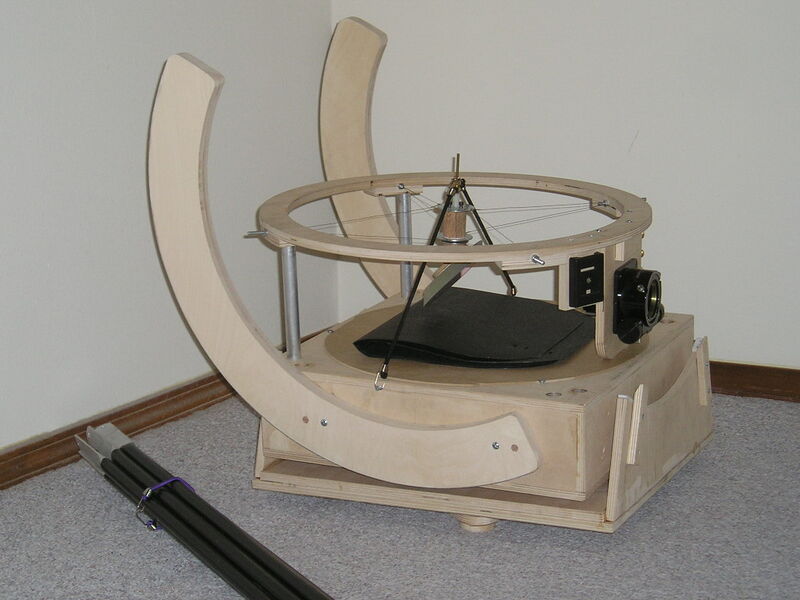 Vibration - The scope has no vibrational issues unless there is a pretty strong wind. Even then, this scope is generally the last truss telescope still standing at the end of the night. At 457 power the scope takes about 2 - 3 seconds to stop vibrating. At a lower power, it is useful immediately. One problem is that it vibrates more if placed on grass or dirt. This is probably due to it's light weight/ length/magnification ratios. Baffling - I ended up with a piece of black foamboard from Kinkos. I stripped off the front and back paper, and then forced a crease down the board every few inches. Then, I just push the board over the threaded rods on the secondary cage and attach the brass nuts. Works like a charm! I have not added any other baffle or shroud, and feel that I don't need to. Build cost - as stated above, it was around $1500. Not bad for a 16"! I am probably not the most objective person to be evaluating this scope, but since I am all I have, here goes. The scope is very sensitive to Columnation. When columnation is right on, stars are pinpoints using any eyepiece that I have, including my 8mm. With exceptional seeing, using a 2x barlow and my 8mm eyepieces (giving 4mm) works acceptably well with Saturn. With good seeing, the 6 stars of the trapezium are obvious, are pinpoints, and are viewable with direct vision. The double double stars in Lira are splittable, and I can see a thin dark lane between them. I could not see the center star of the Ring nebula. In medium dark skies with GOOD seeing, I could see the darker area of the horsehead. I have not looked at Saturn under good seeing yet. Star tests look very symmetrical around the center. Fan. This is still under evaluation. I believe that an under the mirror fan did nothing. Next, I need to try to get a fan blowing across the surface of the mirror. I believe that this is the last light bucket scope that I will ever have. 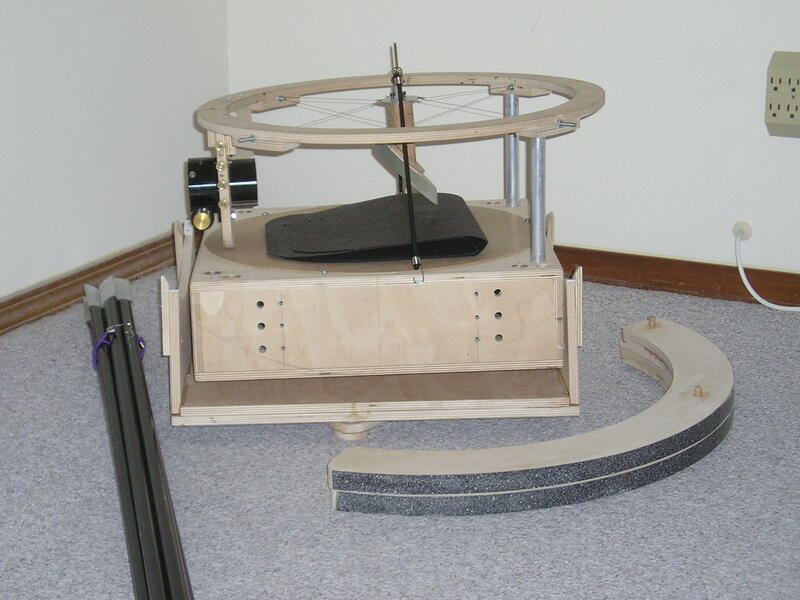 It is big enough, easy to transport, easy to setup and tear down, and looks cool.